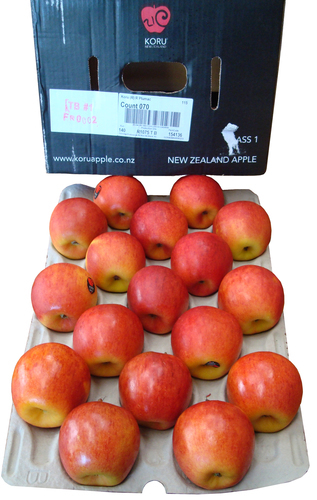 Yakima, WA - Borton Fruit is excited to announce that we will be importing The Plumac Variety – Koru® Apple out of New Zealand with first arrivals coming mid-May. The Koru® Plumac c.v. is especially unique being it was discovered as a chance seedling by Geoff Plunkett in his garden in Moutere, near Nelson, New Zealand in 1998. Where most new varieties are discovered through years of scientific breeding tests, the story of the Koru® is more of a natural phenomenon. Consumer testing in key markets over the past several years has seen Koru® rated as being at the highest level, and above competitor varieties, in every market which is incredibly rare. 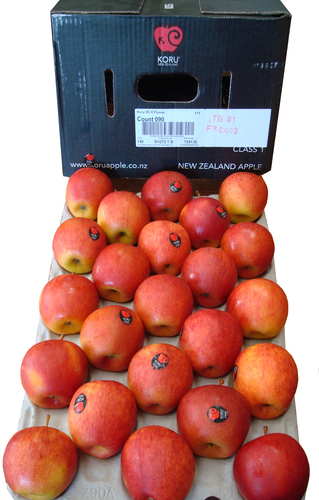 The Koru® Apple is a distinctive orange/red color providing merchandising value. It has a sweet, aromatic flavor with a rich honey-like aftertaste and a very good sugar-to-acid balance. The flesh texture is crisp and melting, leaving no mouth residue. Borton plans to import and market the Koru® Apple with long term goals of growing it here in Washington State! To learn more about the Koru®, please see link below.